I’ve had a busy day creating in my craft cave this morning and this evening and loved every minute of it! In the afternoon we went off to the football to watch my son’s friends play in the finals and froze our toes off. It was belting down rain and all I could think of was getting back to my warm room and which card I would make next! Why is it that when you upload your photo you realise only then that one of your tiles is a bit crooked? It looked fine when I took the photo and now looking at it, one’s slightly off. Does that happen to anyone else? I’ve just fixed it up but I ran out of time to take the photo again! Love your card, doubt I would have noticed the tile, til I went looking for it! I feel your pain…..often when editing photos….it seems an ink smudge appears, a bit of bling disappears….I think it takes me longer to take photos and post my cards than it takes to actually make them! Thanks for playing with us at Freshly Made Sketches! Lovely layers, it often takes the camera’s “eye” to spot the faults I find. I wouldn’t have noticed any crooked tile either, if you hadn’t said! Hi Narelle! I love that you went with only white and red, very distinctive. And I agree with Allisa, I probably wouldn’t have noticed the crooked tile! And I have noticed things like that many times with my cards. I just tell myself, that’s the charm of a handmade card – LOL! Thanks for playing with us this week at Freshly Made Sketches! What a great card Narelle! I love all that red! Such a unique take on the sketch! I never would have noticed a crooked tile!!! Did you cut each of those bingo bits out? That’s incredible! Thanks for joining us this week at Freshly Made Sketches! Wow … what a great card Narelle! 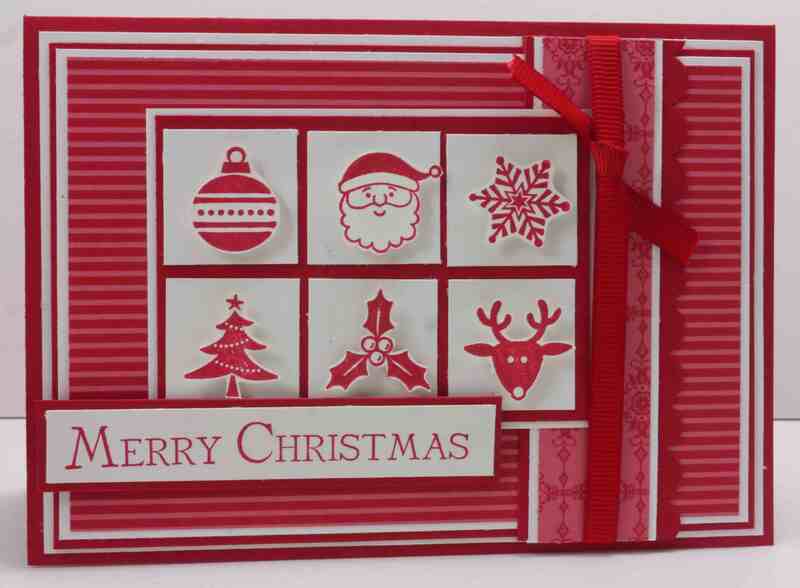 I love your red and white theme and your fussy cutting is awesome! Great take on the sketch, Narelle! Awesome Christmas card; into my favorites! Thanks for sharing with us at Freshly Made Sketches this week!